I think I mentioned before, that since our little one is due to arrive Christmas Eve, I am hoping to get all of my Christmas shopping and planning finished early this year. In our family, the traditional one present on Christmas Eve is always new pajamas for each child. The other night I ran across the cutest little nightgowns for girls, in the clearance section at Lands' End, and just had to share them with you all! I actually ended up ordering two for each of my girls, this one in solid red, and this fleece one in ivory. (In fact, this one would actually make a darling gown for Santa Lucia Day!) They have others available as well, all 50-70% off regular price! While I was there I also ordered cowboy themed fleece and flannel pajama pants for my boys. Now I can check those four items off my list!! Yes, it does get rather cold around here... It is finally starting to warm up for summer! Good find, Jessica! I wonder if I order them now, would I remember where I put them come Christmas??? Thank you for posting this! 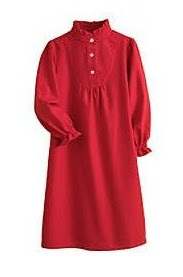 I just ordered two red nightgowns for my girls to wear at Christmas, 2 more nightgowns for Winter and a bathrobe for my oldest daughter (for a Christmas present). Thanks for inspiring me to always think ahead for holidays and such. I am finally starting to buy gifts all year round and storing them away. If I find a good baby item I buy it and save it for a baby shower. Thank you for the great deal. My children will be pleased! OH! Those look so nice!! I am going to go and check them out! Jessica! How do you stay caught up? I can hardly keep up with my daily events...let alone blog about them. What a great find - I love Lands End overstocks too! I am so glad to have discovered your blog (congrats by the way on the nominations - so wonderful!) Even more, I'm happy to have met you at the HS conf. in May. It really is a small world, knowing mutual friends. I've been enjoying your blog all day, especially your curriculum posts. You will be in my prayers for your pregnancy too. Kegs1995 ~ I tried clicking your profile to see if remembered meeting you but it didn't come up :( Thanks for your prayers and for the kind words about my blog!! I updated my profile. I wasn't sure what was going to display, so I fixed it. I had the little baby boy, and my friend had the little baby girl and we all lunched together at the conference. hope that helps.